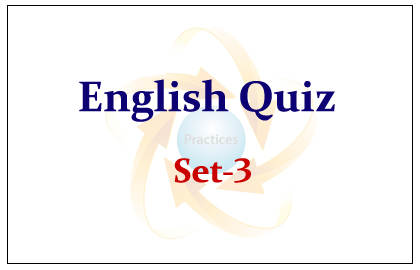 English Quiz for upcoming IBPS PO/Clerk and SBI Exams were given below, candidates those who are preparing for the examination can use this questions. Directions (Question: 01-05): Each question below has two blanks, each blank indicating that something has been omitted. Choose the set of words for each blank that best fits the meaning of the sentence as a whole. 1).The RBI has been ___________ in finding solutions for viable infrastructure projects which will once again gain traction when economic which will once again gain traction when economic growth __________ in. 2).One of the __________ to meeting huge capital requirements it s to __________ a holding company structure. 4).Two areas ____________ the pressure is expected to be ___________ are education and culture. Directions (Question: 06-10):Remaining the following six sentences (A), (B), (C), (E) and (F) in the proper sequence to form a meaningful paragraph and the answer the questions given below. (A)Cards are issued to approved clients for purchase of goods or services form authorized merchant establishments on the credit guarantee of the issuer of credit card. (B) Credit card is one of the delivery channels of the banking services. (C)It is a novel way of providing value-added services to bank customers. (D)Due to the advancement of technology and easy accessibility to credit, the credit cards are gaining popularity nowadays. (E)This is generally useful in emergencies. (F) They can purchase goods and services at a large number of merchant outlets up to the inbuilt ceiling credit limit amount without using cast or cheque. 6) Which of the following should be theFIRSTsentence after rearrangement? 9).Which of the following should be theFOURTHsentence after rearrangement? 10).Which of the following should be theSIXTH (LAST)sentence after rearranging?